The genus Kniphofia contains hardy perennials that reach from 60 to 150 cm in height. They have grassy leaves, that give rise to long stems with a head of downward facing tubes of flowers. 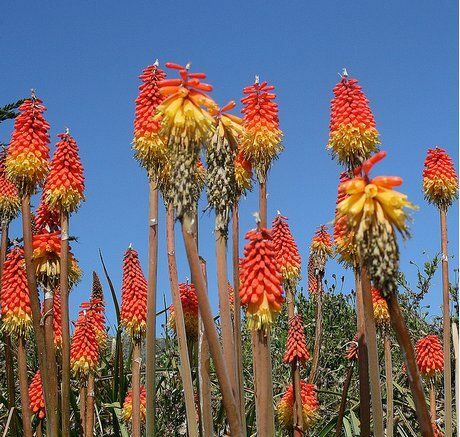 The flowers are orange, yellow or green and Kniphofia blooms from Summer to Autumn. 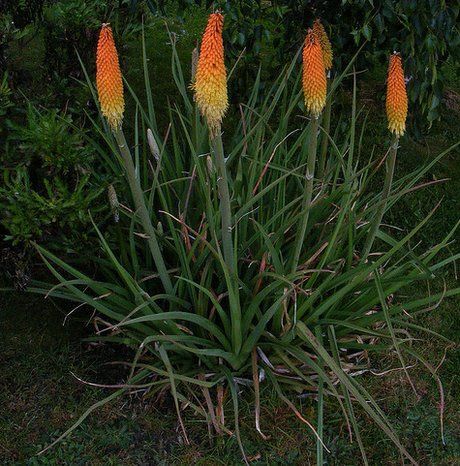 Some of the common names for Kniphofia are Torch Lily and Red Hot Poker. Photographs: Kniphofia uvaria by Jill Clardy and Red Hot Pokers by Zabdiel. Common Names: Red-hot-poker, Torch Lily, Tritoma, Poker Plant. Scientific Names: Kniphofia uvaria; Kniphofia caulescens; Kniphofia rooperi; Kniphofia flamenco. Flowers: Species dependent: Summer and/or Autumn. Flower Details: Red, orange, yellow, green. Upright. Multicoloured. Clusters. Tubular. Drooping. Sow Outside: Rhizome: 2 to 3 inches (5 to 8 cm). Spring or Summer. Spacing 12 to 24 inches (30 to 60 cm). Seeds: 1/4 inch. (3 mm) Start of spring - before the last frost, or towards the end of autumn. Sow Inside: Germination time: one week to one month. Temperature: 70 to 75°F (21 to 24°C). Use peat pots. Seven or eight weeks in advance. Transplant outdoors following the last frost or in autumn. Requirements and care: Full sunlight or partial shade in hot areas. Good drainage. Soil pH 6.0 to 7.0. Deep soil, rich soil, moist soil. Plenty of water at the start of the growing season in the spring. Cut back flower stems to the ground in autumn. Propagate: by dividing established plants (older than four years) in the spring. May not grow true from seed. Miscellaneous: As many species produce large amounts of Nectar they are attractive to birds such as Hummingbirds and Orioles. Torch Lily and other Kniphofia can be grown either from seeds or Rhizomes. The seed should be sown at a depth of 6mm before the last frost of spring; the rhizomes should be planted about 6 to 7 cm deep in either spring or autumn. They prefer to grow in sunny parts of the garden but may require partial shade in very hot areas. Torch lilies should be grown in a soil that is rich and deep; ideally the pH should be 6 to 7.5. If you prefer to start torch lilies off inside then they should be prepared about 6 to 7 weeks before they are due to be planted out; either in the autumn or after the last frost of spring. Torch lilies take from one to four weeks to germinate at a temperature of 21 to 23 degrees Centigrade. Although Kniphofia are pretty easy to look after it is important not to disturb them to often; if you require more plants then they can be divided in the spring time, but do not do this more often than every 5 years. While growing torch lilies should be watered regularly until the buds have set. Following flowering the stems should be cut back to their base.